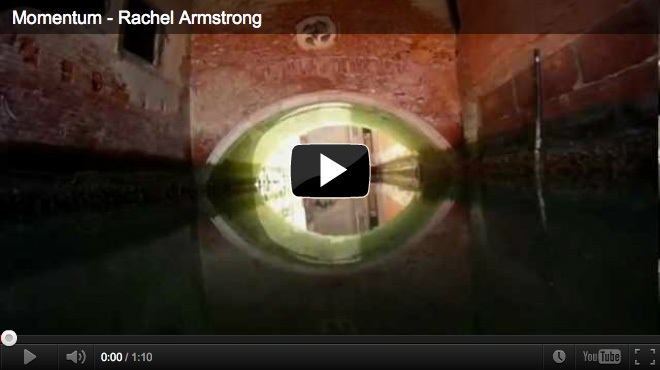 A styblo.tv production for Red Bull TV, 26` documentary about Rachel Armstrong saving Venice by using protocell technology, © 2011. English, German (voice-over), produced and directed by Robert W. K. Styblo. Camera: Panasonic HPX 3000 (Full HD) + Full Set Movie Lenses "pro 35 AD". Additional Cameras: Panasonic HVX 200 (Full HD), Canon 5D (Full HD), 2 x GoPro "Heroe" (Full HD). Venice is sinking. The next generation of technology that could save Venice might harness the power of "life" to produce a living technology with some of the amazing properties of living systems. Rachel Armstrong is working with an example of living technology, which uses the life-like properties of "protocells", simple chemistries made by mixing oil and water. Her protocells have been chemically programmed to create an artificial limestone reef underneath the city by using local materials in new ways. Protocells can be designed to remove carbon dioxide and minerals from the water and work alongside Venice's native carbon-fixing marine organisms to grow a solid structure. With monitoring and cultivation, the reef is expected to gradually spread the point load of the city and stop it sinking so fast into the mud on which it was founded. "Momentum – Rachel Armstrong" is a documentary about the amazing life of a real genius of today and her quest to developing a new living technology. Filmed in Oxford (England), London (England), Odense (Denmark) and Venice (Italy).